Littler plays on regardless of the hand they're dealt. 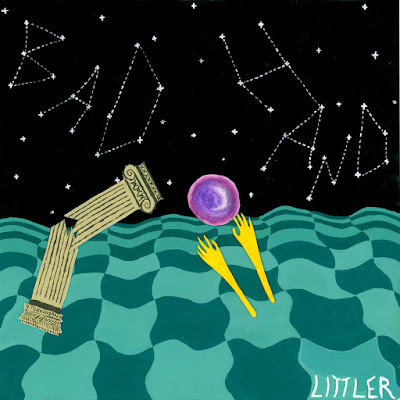 Punk has always been a movement of misfits finding power in each other, and Littler's Bad Hand EP proves that the band has plenty of snarl. “You are NOT ALONE, I am HERE!” singer/guitarist Madeline Meyer shouts into a distorted mic, screaming at us to not give up. Littler’s lyrics occasionally get blurred by the fuzz, but the unrestrained energy is always palpable. The EP was produced by Swearin’s Kyle Gilbride and mastered by Aye Nako’s Jade Payne, and Littler feels right at home among the aforementioned bands. All three are punk outfits that pair slightly dissonant melodies over guitars that seem like they're scratching at the walls. Even when they're bemoaning the injustices of the world, they’re always pushing forward, searching for something. Opening track “Running Hot” has a soaring chorus that invokes the same gritty magic that made Dinosaur Jr. a massive cult favorite. I can’t make out that many of the lyrics, but that doesn’t stop me from murmuring along under my breath. The album title references a bad hand in cards, an unlucky set of circumstances that, without some clever moves, can mean defeat. If the bi-coastal band’s debut album was about the anxiety of not knowing what your life would become (AKA what hand you’d be dealt), this EP is about realizing what a raw deal adulthood is and deciding to play on anyway. “Oversteeped” is a parable of making a choice to leave a toxic situation - “I’ve been here way too long / I wanna go outside” finishes the chorus - that features some classic loud/soft dynamics. “Lousy” feels like staring out of a dirty train window as you dully contemplate your life. "I don't care where I'm at, as long as it's free,” Meyer and fellow singer/guitarist Dan Colanduno sing. There’s a comfort in its malaise as the tempo slowly winds down, like drifting off to sleep after a long day. There was a period where it seemed like Littler was winding down as well. Bad Hand was recorded before the band took a hiatus last summer as a result of the members being split between LA and Philly. A recent West coast tour behind the EP shows that the band still has some energy left - now we can only hope they make it back to the East coast. Listen to Littler on bandcamp.